Listen, it’s brunch and there’s no such thing as brunch without champagne. That doesn’t mean that we have to be cliché about it! Everyone likes a good mimosa, there’s no way that we aren’t going to include this sensible sister of champagne cocktails! It’s a no brainier! So, get your bubbles and some OJ and build your beverage bar around that. We aren’t talking Dom, here ladies… Hell, we aren’t even talking Veuve! Those bubbles should not get muddied by any other ingredients. For this, use a champagne, or a sparkling white (for those of you who will call me on it) that is good enough to drink alone but that doesn’t require deep pockets. I took some time recently to try a few champagne mixers with my mom. She’s a cheap champagne connoisseur. By connoisseur, I mean she is well versed in buying inexpensive champagne by the case and stretching it to last the weekend, but I digress. A midrange bottle (or five) will do the trick. Stay away from overly sweet wines. The added ingredients can be controlled to suit varying tastes. We tried a number of mixers. We found some that we loved and some… Not so much. Dry champagne mixed in a 5/1 ratio with this elder flower liqueur will knock your freaking socks off! Seriously good stuff here. I didn’t make it up, it’s a common addition to champagne and should not be left off of your champagne bar. Muddling a few mint leaves in the bottom of your glass will add a nice and unusual touch. This is an incredibly sweet mixer. A little goes a long way, one can of nectar will make 8-12 champagne cocktails. This is a sort of, poor man’s Bellini. You can just open a can and set it out if you like, but that would be pretty basic and since you’re reading this, it means that you aren’t, in fact, basic. I would suggest pouring it into some sweet little container. A coffee creamer would do, as would a small decanter or even a cute little canning jar if that’s more your speed. Lavender bitters? The hell you say! Yep, and if you do not have a bottle, I suggest you invest post haste! I say “invest” because the beautiful cobalt blue bottle is about $20 for 8oz. Disp are not, though! It will last a very long time because a little goes a very long way. I personally prefer my champagne to not be terribly sweet. Extra dry is not as dry as brut but not cloyingly sweet. About six drops swirled around the flute is sufficient. 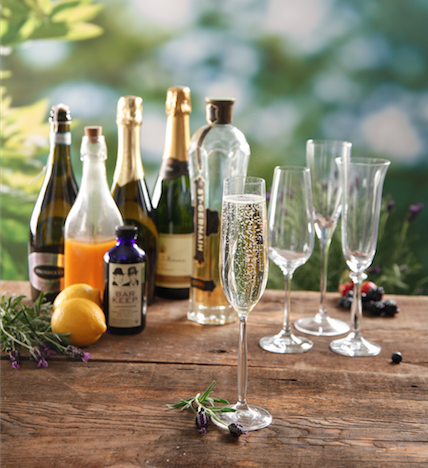 Add your champagne and you have a beautifully floral drink that will be the talk of your gathering. I enjoyed this application very much. So much so, that I promise you will be finding further use for your lavender bitters latter in this book. Appropriate garnishes include; mint sprigs, lemon twists, frozen berries, stems of fresh lavender and whatever sounds wonderful or is seasonally available. These are just a few examples of what can be added to champagne to shake things up a bit. Put them out with orange juice, cranberry juice and a variety of garnishes and you can’t fail!